This past summer LifeNets gave a gift of $350 to Yuri Velichkanich, age 22, of the Transcarpathian village of Lipitska Polyana for treatment in Kiev. Yuri had spinal / brain trauma. While he and his father were loading firewood on a truck a load of wood fell on him and broke his back and was totally bed-ridden. 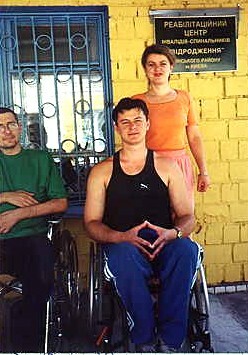 With treatment in Kiev he has has improved and can now use a wheelchair. He is also going to be training on a stationary bicycle to help muscle development in his legs. Yuri has written a letter of thanks that I'd like to share with you. I would like to inform you that the money which you designated for my course of treatment in May and June was used for this purpose at the Rehabilitation Center in Kiev called "Revival." The result of this led to some improvement in my health. I now have hope for the restoration of my health and regaining the lost functions of my body. My parents and I are grateful for your health and success in our your work. Thanks to everyone who has been helping the Sabbatarian community in western Ukraine.